Whilst I enjoyed writing the stories for homework, I was also writing my own in my spare time. There was a spell, from the ages of 12 to 14, when I was doing 5,000 word, hand-written stories in customised exercise books, cut down and made to look like novels. I would design the cover and be very proud of my efforts. I got my brother, George, to design one cover, and it was so good that it was better than the story! I still have those books to this day. George designed the impressive cover to Time Trap, but I hope history hasn’t repeated itself. He has also done a great job on the illustrations, but more about them later. When I left school, I continued to write. I started a story, (again, hand-written) when I was 17 and completed it three years and 80,000 words later. It proved that I had the capacity to write long stories, though many of my writing techniques left a lot to be desired. But back then, I just loved to write. Believe it or not, I started piecing together Time Trap, which was initially called A Change in Time, in 1984, when I was around 22. It was my love of Victorian London that started it all; and were it not for my passion for that era, I don’t think I would have continued with the same story. (The old adage 'write about what you know and like' is definitely true!) For the first three years or so, all I had was a feeble plot and some character names. Hector, Simon and Jamie were all there back then, but Todd was Harrison, originally. It was then put to one side, and my writing ceased for about five years, as other pursuits got in the way. Then, as I hit 30, a huge urge stirred within me and I picked up the pen again. I fell in love with writing once more and wrote the first and second chapters for the first plot of A Change in Time. I gave the two chapters to my mum and sister, Sylvie, (my mum and sister have the same name) to read, and they liked them, which gave me the support I needed. And so I began to write a chapter and then hand it to them, a bit like Charles Dickens did when he serialized one of his stories to a newspaper. My mum and sister would be waiting for the next installment which was good for me, it spurred me on. A Change in Time was finished in 1995, and much enjoyed by my mum and sister. It was hand-written on lined paper and about 100,000 words. My next step was getting it printed. I bought a word processor and began the laborious task of typing it all in. Although it was a state-of-the-art piece of kit back then, only five lines were visible on the narrow screen and when one page was printed, it would thump along at a very slow speed. Over the next three years or so, I began sending sample chapters to agents and publishers - something which I was to do many times over the years, but always without success. In 1999, I began to take writing seriously, and went on and completed a writing course, and studied how-to books on the subject. I should have done this when I was much younger, I know, but at least I started. I sent my story to an appraiser for the first time that same year. She told me the story was way too long and didn’t have a chance of publication. With that statement, and at that moment, my determination and real belief in myself and my story kicked in - with added encouragement from my mum, I carried on. I wanted a second opinion, so in 2001, I sent the ms to another appraiser - Jean Evans - and it was she who pointed out to me where I was going wrong. It was as if I had been looking down the wrong end of a telescope from the start! I had two plot-changes in mind: the current one, and the one I went with at the time - which involved angels. I sent sample chapters to agents and publishers, but with the same result: not interested. The years past, and in 2006, I changed the plot to the present one. The scientific elements of the story needed quite a bit of work, so I got my nephew, Carl Smith, involved. He put right all the technical facts on time-travel, making it sound quite feasible. At about this time, I was also struggling to find a new, punchier title. Once again, it was Jean Evans who helped me. She said, 'Why don’t you call it Time Trap?' I had my new, ‘punchier’ title. Over the next few months, I worked on improving the story. The following year, I met someone who has been a big help and inspiration to me: Ken Titmuss. I heard him on the Robert Elms Radio Show, talking about his London walks, London Trails, and he just happened to be talking about an area of London which features in Time Trap: St Giles, where the Holton Gang have their hideout. I contacted Ken and he took me on an entertaining St Giles walk. As Ken is very much into maps, it was his idea to have a map in the book, pointing out the locations, and his inspired suggestion to have the Time Trap Trail - details of which can be found on this website. The year 2009 was an important one. In early January, I found another appraiser, whose editing lifted the story to an altogether higher level. Pat Richardson of Perfectly Worded has brought Time Trap up to publication standard, and were it not for her marvelous input, I wouldn't be going down the road of Print-on-Demand. In March 2009, I attended the centenary of Uphall School, in Ilford, my junior school, where I actually looked into that classroom I mentioned earlier, when I first had a sense of myself as a writer, reading aloud one of my stories to the class. During the 2009 visit to my former school, I told the Deputy Head, Kulvarn Atwal, about Time Trap (which, by then, Pat had much improved). He asked me to bring it in, and said he’d get a teacher to read it to a class - which he did. Afterwards, I was invited to meet the class, which was a great experience. We had a Q & A session lasting about an hour, then the children told me which parts of the story and which characters they’d liked. Some of the pupils even said they would like to take up writing, after seeing what I have achieved, which gave me much satisfaction. 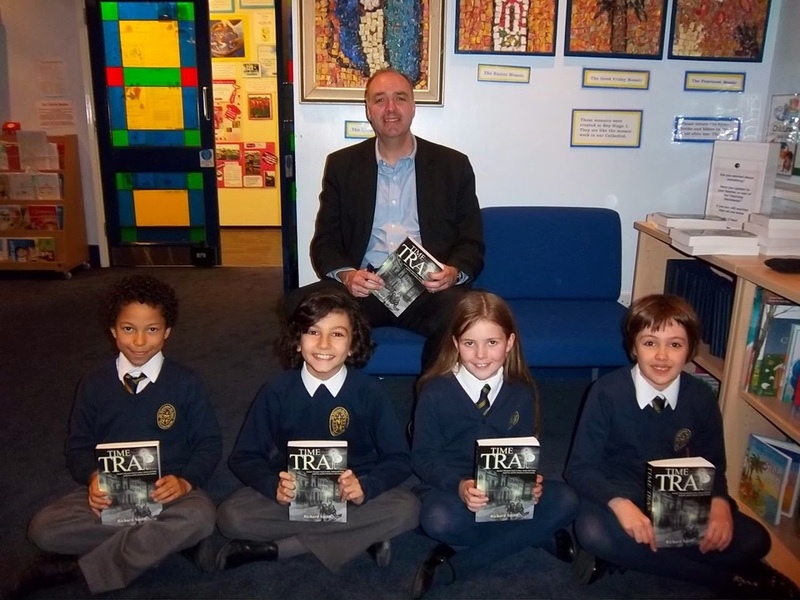 The glowing reviews from 25 pupils confirmed my belief that Time Trap is a good story. Yet, even though two literary agents have since then asked to read the whole MS - which in itself is an accomplishment - I still failed to find an agent or publisher. In 2011, I made contact with one of my old Secondary School teachers, Ian Franklin, who is a New Zealander and lives there. The last time I saw him was back in 1977, when I was writing my ‘customised novels’. He helped with the story, via emails, and it was his suggestion to have illustrations in the book, but I wasn’t keen on the idea. I went to see him in early 2012, and again, he mentioned illustrations, and still I was against it. Then, when the printers had the story, I had a change of heart, and could see the benefits with illustrations, and an eleventh-hour decision was made to include them. Time Trap was released on November 7th 2012. A big breakthrough came in February of 2013, when the British Museum decided to stock it in the Great Court Shop. At around this time, Bookmarks Bookshop in Bloomsbury Street also took on the book. The book was featured in April's Covent Garden magazine, and I have been into Highlands Primary School for a book signing. After all the years working on Time Trap, it is so rewarding to have my work appreciated by an audience wider than friends and family. Even though I have yet to find a publisher, I hope that if you read the book and possibly go on the Trail, you will agree that it is worthy of such an occurrence. And now. I'm pleased to reveal my new book, The Darziods' Stone, which took seven years to complete, including a couple of years of inactivity, when I struggled with the plot. It's aimed at a teenage readership, twice the length of Time Trap, and I'm hoping I get as many favourable reviews as it. Want To know More About Richard Smith? You're in luck! Rukia's Interview with Richard about his life and newest book The Darziod's Stone is below. 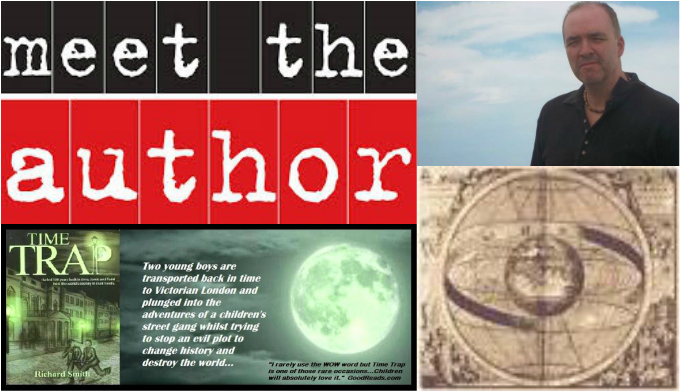 We also have an interview from The Book Bag and some other links for you to check out! Hello everyone and welcome to Richard Smith's author interview. Richard Smith is the author of two outstanding books, Time Trap and his new release The Darzoids' Stone. Richard has kindly agreed to take the hot-seat to answer questions from our Rukia Publishing readers' group about his life, his writing and his books. Thank you for taking the time to join us today. We would like to start by getting to know a little about you and how you came to be author? All I wanted to do in English was write stories, long or short. I was also interested in authors, and enjoyed doing projects on them. One thing I didn’t bother with and I should have, was learning what I call the nuts and bolts of writing; finding out exactly what were nouns, pronouns, adverbs etc. I think it’s important to know these things. I hope one day my books will find a publisher, that has always been my dream. When I was young, I was overawed by Charles Dickens and his great works. I admire J K Rowling for her huge imagination and her prolific writing. The Potter books came thick and fast. I also like the writers Roderick Gordon and Brian Williams who co-wrote the Tunnels series, those books came thick and fast but there are two of them. My first book was a labour of love, Time Trap, which took 15 years to complete, and my second which has recently been released is The Darziods’ Stone. My next book will be a sequel to Time Trap: Time Trap II. Jamie and Todd become embroiled in another time jaunt, this time going to 1775 America, with Hector and Catherine, to stop an agent from the first book, joining forces with the American insurgents, with a super weapon, which will alter the world immeasurably. I have always been interested in these genres. When I was a small boy, books and TV programmes on the subjects fascinated me. How much research do you complete to add depth to your books? I like to be very thorough, for instance, I went to Cornwall and found a cove I wanted to base Tredock Cove on, in The Darziods’ Stone, and it really helped, I could write about the cove with conviction. No, but I’m working on the plot to Time Trap II with my brother, George. I started writing stories at primary school, aged around ten, the teacher made me read one of my first stories to the class, saying it was so good the class should hear it. That really gave me the bug to write. Good question. It’s like a burning within, a story forms in my head and I just have to write it. Part time, when I get the urge. I have a job which enables me to write. When I’ve completed all my duties and there’s nothing pending, I sit at the computer and write. I need to have the urge to write, which doesn’t always come freely. No, I just let it flow and carry on until I call it a day. It used to be longhand in the early days, but now computer, that’s the way to go for me now. Writing can be a lonely pastime (but rewarding one) and one thing I found when I was struggling to continue with the plot, was no one could help. I asked several people for ideas but nothing was forth coming. I’m now glad it was all my own doing in coming up with the rest of the plot..
Sticking to a plot line. My first took 15 years, a long time I know, but there were three plot changes and a lot of that time, I was learning how to write. The Darziods’ Stone took seven years but two of them were inactive. Yes, when I run out of plot! To me, you can’t beat a hard copy. It’s personal to you, you can write your thoughts in it, and it feels more real when your holding it. Nothing at the moment as I’m working the plot for my third book (which I will make sure I finish this time), but the last one was a book on the Knights Templar, for research for The Darziods’ Stone. I write the book to the best of my ability then send it to an editor I’ve used for both books. Pat Richardson of Perfectly Worded edited my books who I am very pleased with. I found her in the ads at the back of a writing magazine. I laid out how I wanted the book. At the moment, it’s in paper back. I discovered FastPrint at the annual writing fare at Earls Court. I met with them, asked loads of questions and went with them. I’ve been happy with their service on both books and will use them again. I came up with both covers to my books, which came instantly to me. My brother George drew the covers, as well as the sketches in each book. Going down the self-publish route, the writer is in total control on how the book looks, but I would still like a recognised publisher to take on my books. I have a website, it’s on Facebook and I try and get as many reviews as possible. Also, I have Rukia Publishing running a very good twitter campaign. I did try the PR path once but it proved too costly. Look for people who do them on line. Every review so far has been very favourable. Which social network(s) works best for you? Freebies always create an added buzz, and is essential for marketing. It’s a series of books; the Tunnels series. Probably for its originality I think. The Godfather. Terrific story-line and fantastic acting. In relation to writing, where can you see yourself in 5 years time? Don’t get into the wrong crowd at school, or at least concentrate totally on writing and learn all the techniques as soon as possible. Although I continually wrote stories at and after school, my first self-published book wasn’t until I was 49. I would say I’m 25 years behind, but better late than ever. Learn as much about writing early on. Get self-help books on writing and join a writing group. Where can we by your books Richard? Readers can find the details of my books on my author website by clicking here. Thank you Richard for taking part in our readers hot seat interview, we hope you have enjoyed it. 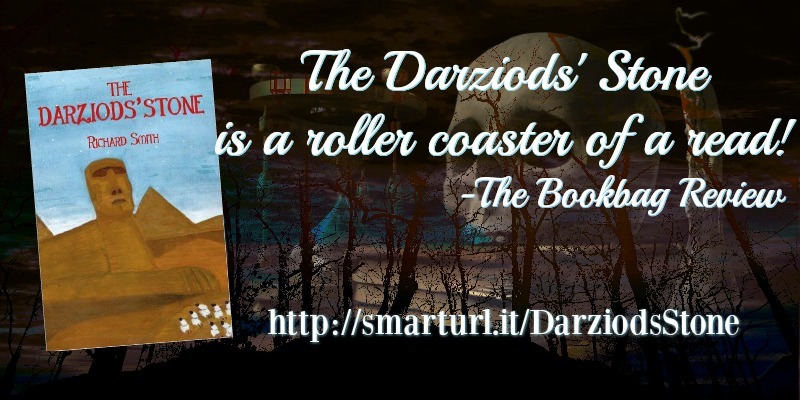 We look forward to sharing some of the reviews from The Darzoids' Stone very soon. ​ to get a feel for the story before we meet the man who created it. Since Jamie's dad took a very well paid job, moving into a big house and buying a nice car, he fell out of favour with Todd and the others. When the Riverside Posse was formed, Jamie wasn't invited to join, which left him vulnerable. Being useless at football and not making the school team left him even more ostracized. Jamie has excelled in astronomy ever since his Uncle Simon told him stories about Catherine, who was a fine and revered Victorian astronomer. Hector is a lover of life, and makes the most out of any situation. His positivity has brought him huge rewards, both financially and having great experiences in life. Rising to captain in the British Army, before being wounded in action, Hector changed course in life to follow his passion; engineering. Working in America on the locomotives there, and working alongside Isambard Kingdom Brunel made him a wealthy man. In love with Catherine and asked her to marry him, but was turned down. 20 years younger than Hector, she is an esteemed astronomer, following her father, who died of cholera in the 1850's, into science. Catherine was good friends with Hector, and for a spell, they worked closely with each other. The Holton Gang is led by a fearsome 22 year-old, who runs an organised outfit, where everyone has, and knows their job. He demands loyalty within the gang. They are banded together because they have to survive the cruel times and lack of welfare, unlike Todd's gang, who are together by choice. An author had his own time travelling experience as he returned to his hometown to tell children about his new book. Richard Smith, a former pupil at Uphall Primary School in Uphall Road, Ilford, visited Highlands Primary, Highlands Gardens, Ilford, to sign books for the children. One child in particular, Sean Faria, managed to finish the book in just three days. The story involves two boys who get transported back to London in 1862 and features a hidden code to crack that leads you on a trail through the capital’s streets. Imagine reading a book, then visiting the very places where the story happened; it would almost be like going on a virtual-reality tour. With Time Trap, you can do just that, and see the London locations where this exciting adventure is set. The Trail is an adventure, too - but not just anyone can go on it. You will have to read the story first, and find in it two keywords that will unlock the code, and allow access. So read the book, crack the code and follow in Jamie's and Todd's footsteps as they were hurled back to 1862, when the streets of London were shrouded with smog, and danger lurked at every turn. Following the Time Trap Trail will show you a very different London - one that few may know. You'll visit the scenes of all the crimes that Jamie and Todd were involved in when they had to join the Holton Gang, and see where the gang's hideout was. You'll go to the church they took refuge in, and find the location of the Secret Operations Bureau by the Thames. (And beside the river will be a great spot to stop and enjoy a packed lunch!) On the Trail, you will also see the real Temple Bar, which has been moved from its original spot. 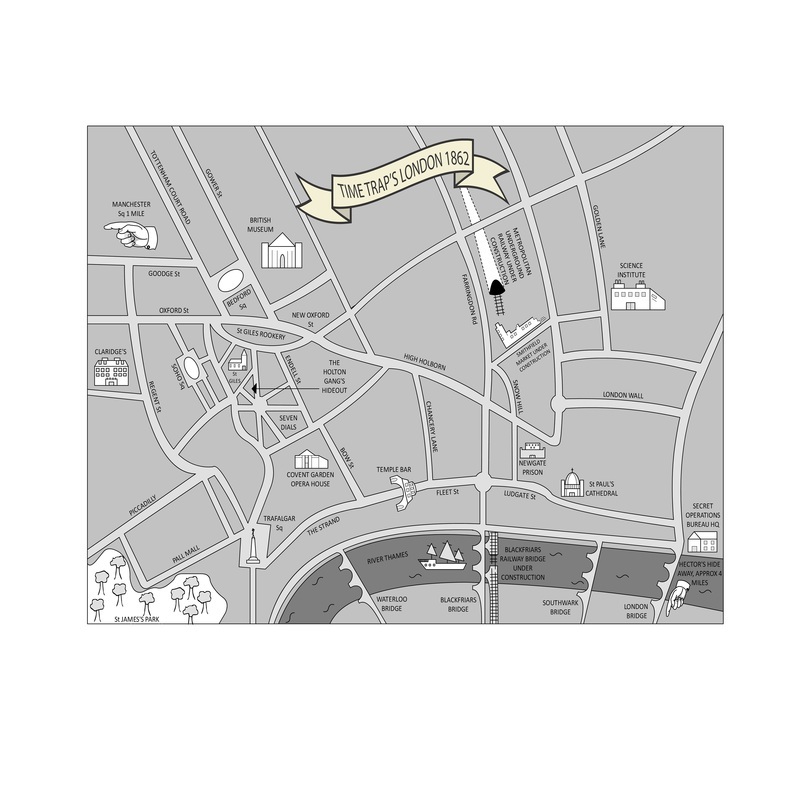 You'll follow the getaway route the boys took when Billy stole the case from the coaching inn. And you'll get to see magnificent St Paul's Cathedral - and many, many more locations featured in the book. Plus, there's an added guide to other attractions along the way. Although not all the landmarks in the book are still here, while you travel around London, you will learn more about the city. See the contrasting parts of the metropolis - the grand buildings of Bloomsbury, including Bedford Square and the British Museum; the bridges over the River Thames, and the big, bustling shops on Oxford Street. There are two Time Trap Trails. 'The Trail' which will take around 1.5 hours to complete and is perfect for school trips or those short on time! Then there is 'The Grand Trail', which will take about 5 hours. This is for the adventurers among you and is a full day out. These times are without taking breaks, so factor this in to your day. 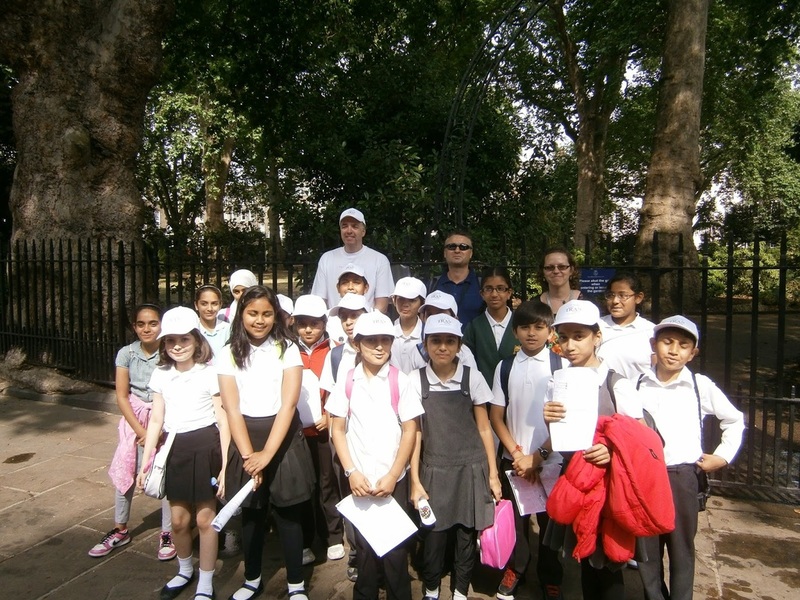 You'll need sharp eyes too - because on each Trail through London, there are questions for you to answer relating to some locations. If you complete the quiz correctly you'll receive a certificate. Here is the Certificate you will receive (which I will personalize) when you complete the Trail and email me your details (name and date you completed the Trail) and the answers to questions at locations en route. ​INVITE RICHARD TO TALK AT YOUR SCHOOL! ﻿Richard, thank you so much for sharing more about yourself and your book and we look forward to reading The Darziod’s Stone.